The presence of professional entertainment media in our daily life has changed our perception and asks for more demanding and professional presentations also in science: They are supposed to be not only sophisticated in the technical way but – as is common in the US – must be easily understandable and entertaining. Method: 80% practical exercises (contents, structure, soft skills), theory-input of the coach; 360°-feedback; on demand: video evaluation. Trainer :Evelyn Gangl, Speaker’s Corner Heidelberg, http://www.speakers-training.de/content/e2/e136/e142/index_ger.html . When: November 24, 2016, 09:30 a.m. – 3:00 p.m. in the Seminar Room MITP, Staudingerweg 9, 55128 Mainz, Room 02-430. All male and female physicists are welcome. If you would like to attend the event, please register at prisma@uni-mainz.de or Fahrnbach@uni-mainz.de until November 10, 2016. Please be aware, that the number of participants is limited to 12. Being a successful scientist today not only requires excellent research skills and a high, even outstanding professional level, but also “soft skills”, competencies in leadership and management. These may include advising assistants in the laboratory, giving feedback to a student, making sure that the research team has access to the resources needed, and much more. But how do you know what is expected of you as a leader and how do you find your own style in leadership? Planning your career, how do you decide if leadership is where you want to go? In this course we will discuss what challenges a scientist faces when he or she suddenly finds him- or herself in the role of a team leader. You will get to know models of successful leadership and competencies needed, reflect their impact on you and discuss possible next steps with the other participants. Management and leadership: two sides of one medal? Leadership-tasks and leadership-competencies: What will be expected of me and where do I stand? Susanne Marx is expert in leadership, communication and conflict management. As a psychologist Susanne has 25 years of experience as coach and trainer, since 2001 she has been focusing on consulting universities and people working in science. When: January 26, 2017, 9:00 a.m. – 5:00 p.m. in the Seminar Room MITP, Staudingerweg 9, 55128 Mainz, Room 02-430. All female physicists are welcome. If you would like to attend the event, please register at prisma@uni-mainz.de or Fahrnbach@uni-mainz.de until December 15, 2016. Please be aware, that the number of participants is limited to 12. When: March 08, 2017, 7 p.m., Plenar Saal, Akademie der Wissenschaften und der Literatur Mainz, Geschwister-Scholl-Straße 2, D-55131 Mainz. A total of five coachings consisting each of three sessions with an experienced coach will be awarded. Interested women are requested to submit a short letter of motivation and a CV by January 15, 2017 for the Winter Term and June 15, 2017 for the Summer Term 2017. You don’t think coaching does fulfill your needs? You may also apply for any other form of tailor-made support, e.g. child care at conferences, transferable skill courses, etc.? 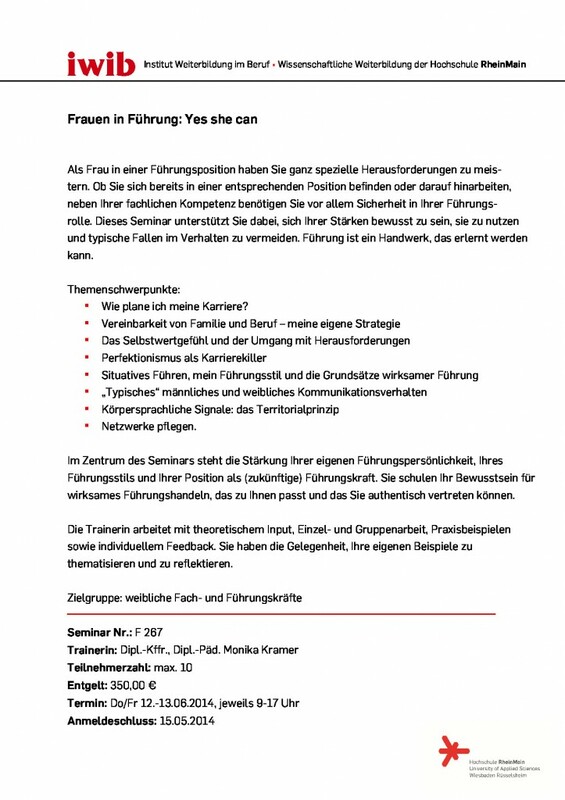 Do you have further ideas or do you need some advice, please get in touch with fahrnbach@uni-mainz.de or prisma@uni-mainz.de. Would you like to train your presentation before e.g. the next team meeting or a scientific conference with an experienced female physicist? Interested women are requested to submit their presentation together with a description where and when they would like to give the talk to sfienti@uni-mainz.de and fahrnbach@uni-mainz.de. June 21, 2016, 1:30 p.m. – 3:00 p.m.
June 28, 2016, 1:30 p.m. – 3:00 p.m. The networking and exchange meeting is a lunch seminar which takes place in the Seminar Room 1 (0-250) or Seminar Room 2 (0-260), Johann-Joachim-Becher -Weg 45, 55128 Mainz. All female scientists at and around PRISMA are welcome. If you like to attend the event, please register at prisma@uni-mainz.de or Fahrnbach@uni-mainz.de until May 31, 2016. Lunch will be served starting at 1:15 p.m. The PRISMA Cluster will apply for a new funding for the period after October 2017. In the proposal, the topic of equal opportunities will be one of the categories. What is important for you? What does help you as a researcher to go forward in your career? What do you expect from the Irène Joliot-Curie Programme? Do you have ideas for future strategies? You are welcome to bring in your thoughts and discuss them with the IJCP-Team. Tuesday June 28, 2016, from 11:00 p.m. – 1:00 p.m.
Seminar Room 1, R 0-260, Johann-Joachim-Becher -Weg 45, 55128 Mainz. All male and female scientists at and around PRISMA are welcome. If you like to attend the meeting, please register at prisma@uni-mainz.de or Fahrnbach@uni-mainz.de until May 31, 2016. In his entertaining, captivating performance, Stefan Verra humorously and zestfully imparts the foundations of successful body language and gives concrete, practical tips for their implementation in everyday work and personal life. He masterfully blends scientific findings and exciting live demonstrations in a perfect Infotainment package – a compact Infotainment performance with exciting know-how on body language for male and female audience. What our sensory organs reveal and the impact they have on us and our body language. Why our territorial behavior is ever-present and how we can use this to our advantage. What kind of movements appeal to our brains and how we can use these most effectively. Positive versus negative tension and what effect these factors have on our everyday lives. What you can find out by the way people shake hands. What really counts in body language and what is a myth. July 25, 2016, 10:00 a.m. – 3:00 p.m.
in the Seminar Room MITP, Staudingerweg 9, 55128 Mainz, Room 02-430. All male and female scientists at and around PRISMA are welcome. If you like to attend the event, please register at prisma@uni-mainz.de or Fahrnbach@uni-mainz.de until July 15, 2016. Please be aware, the number of participants is limited to 20. Project Management for successful researchers. This very practical course allows you to learn project management (PM) methods and tools that can be immediately applied in your own research projects. It aims at (male and female) PhD candidates in physics or any related subject. After the workshop you will know how to plan and control an innovative research project and you will improve your communication with the project partners and increase the motivation and the performance of all project members. The number of projects in and out of academia is growing exponentially worldwide. PM is a discipline whose visibility increased tremendously during the last 30 years and that is always more required, especially in industry. Day 1 and 2 will take place from September 26, 2016 12:00 noon – 6:00 p.m. until September 27, 2016, 08:30 a.m. – 4:00 p.m. in the Seminar Room MAINZ Seminar Room, Staudinger Weg 9, 3rd Floor, Room 03-122. All (young) PHD students of the department are invited. The course is rrecommended for any year of your PHD time, but ideally month 6 to month 11 of your doctorate. You do not need prior knowledge of project management. Nevertheless, the participants should more or less know their research environment (people involved and research topic). During the workshop, participants will be required to bring project examples, issues and problems, which are of interest to other researchers. If you like to attend the complete course, please register at fahrnbach@uni-mainz.de or prisma@uni-mainz.de until May 12, 2016. Please, be aware that there is an additional registration required on June 6, 2016 at the Course platform for the Graduate School of Excellence MAINZ (Materials science in Mainz). Registered students will get more information from the coordinator of the Irène Joliot-Curie Programme, Daniela Fahrnbach. Please, find more detailed information under: http://www.mainz.uni-mainz.de/2651.php. "Storytelling in Presentations: Best Practice TED-Talks"
Storytelling as a technique helps structure presentations as stories that inspire audiences based on a well-rounded balance between depth of content and entertainment. But how does storytelling work exactly and what does a successful story look like? What is needed to turn abstract content into a story that attracts the attention of the audience? A series of recordings from stimulating talks on the platform “TED” and a subsequent discussion will help us answer these questions. The evening event will take place on April 30, 2015, from 6:00 to 8:00 p.m. in the “Fakultätssaal,” Philosophicum, Jakob-Welder-Weg 18, room 01-185. We will meet in front of the KPH at 5:55 p.m. Drinks will be provided and pizza can be ordered individually. 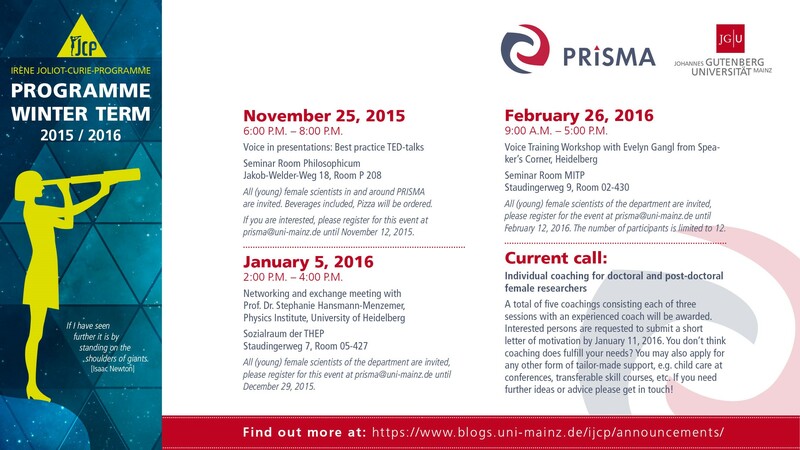 All (young) women researchers at and around PRISMA are welcome. If you would like to attend the event, please register at prisma@uni-mainz.de or jens.ammann@uni-mainz.de until April 23, 2015. 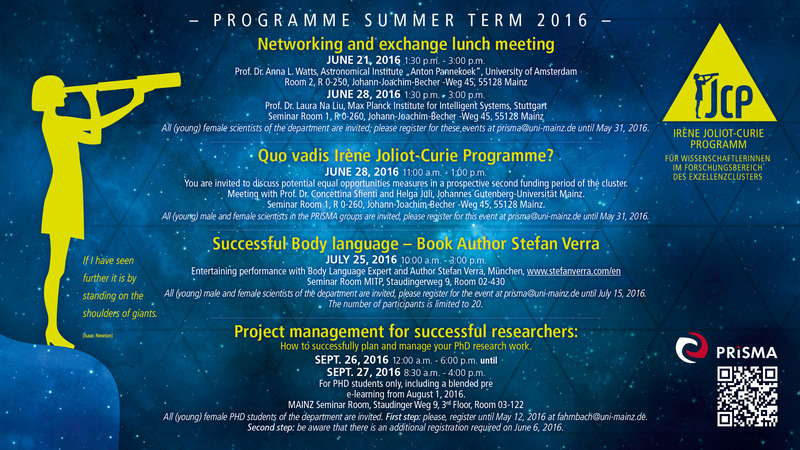 The regular networking and exchange meetings of the Irène Joliot Curie Program bring together (young) women researchers and leading physics scholars. At these informal meetings, issues such as career planning, application strategies, and the compatibility of family and scientific work are addressed. In the summer term 2015, Professor Gisela Anton, chair at the Department of Experimental Physics (Particle- and Astroparticle Physics) at the University Erlangen Nuremberg, will join the program. The networking and exchange meeting will take place on July 7, 2015, from 2:00 to 4:00 p.m. in the recreation room of THEP, Staudinger Weg 7, room 05-427. All (young) women scientists at and around PRISMA are welcome. If you would like to attend the event, please register at prisma@uni-mainz.de or jens.ammann@uni-mainz.de until June 30, 2015. Coffee, tea, and cookies will be served starting at 1:45 p.m. The event will take place on June 18, 2015, from 6:00 to 8:00 p.m., in the “Fakultätssaal” of the Philosophicum, Jakob Welder Weg 18, room 01-185. We will meet in front of the KPH at 5:55 p.m. Drinks will be provided and pizza can be ordered individually. 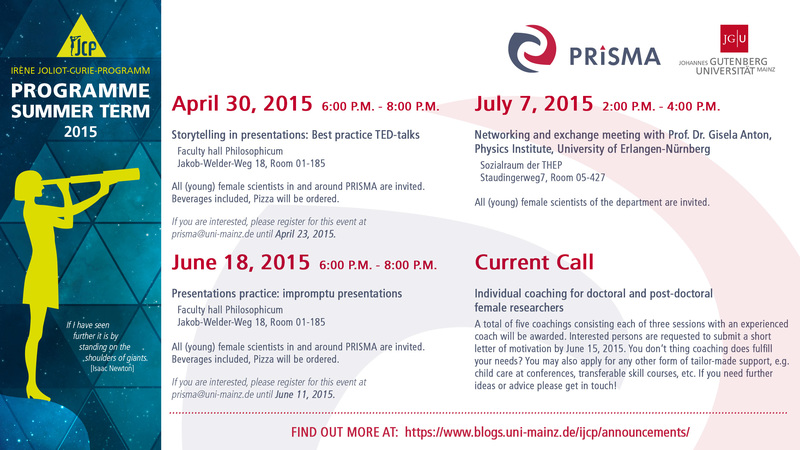 All (young) women researchers at and around PRISMA are welcome. If you would like to take part, please sign up at prisma@uni-mainz.de or jens.ammann@uni-mainz until June 11, 2015. The Irène Joliot-Curie programme is offering individual coaching sessions for young researchers (doctoral and post-doctoral) in and around PRISMA. The goal is to support young female scientific academics in their current career situation, to give guidance regarding important professional decisions and to provide a tail wind for their career path. A total of five coachings consisting each of three sessions with an experienced professional coach will be awarded. The coaching can start from July 2015 on and must be completed within one year. We will provide a list of coaches and assist with choosing a suitable coach, if required. What is your current career path and what are current career objectives? What are your expectations regarding this coaching and on the coach? Why do you think coaching at your present stage of career makes sense? You don’t think coaching does fulfill your needs? You may also apply for any other form of tailormade support, e.g. child care at conferences, transferable skill courses, etc. If you need further ideas or advice please get in touch! 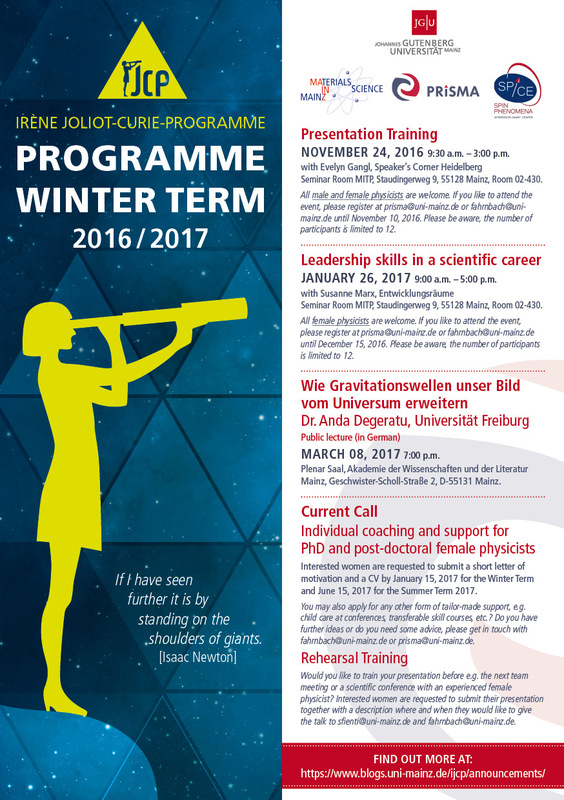 The Irène Joliot-Curie programme is offering individual coaching sessions for young researchers (doctoral and post-doctoral) in and around PRISMA, starting in winter semester 2014/2015. The goal is to support young female scientific academics in their current career situation, to give guidance regarding important professional decisions and to provide a tail wind for their career path. A total of five coachings consisting each of three sessions with an experienced coach will be awarded. The coaching starts on January 15, 2015 and must be completed within one year. We will provide a list of coaches and assist with choosing a suitable coach, if required. As the number of coaching sessions is limited, interested persons are requested to submit a letter of motivation by December 15, 2014. A selection committee of the Irène Joliot-Curie programme together with a Gender Equality Representative of the Faculty of Physics will decide in December, 2014 on the recipients of the coaching offer. • What is your current career path and what are current career objectives? • What are your expectations regarding this coaching and on the coach? • Why do you think coaching at the present time makes sense? In her keynote lecture, the higher education researcher (emeritus) Prof. Dr. Sigrid Metz-Göckel from the Technical University Dortmund speaks on “Karrierefaktor Kind für die wissenschaftliche Laufbahn” (German Language Speech). Based on respective statistics and social scientific research results, she, for example, elaborates on the relation between precarious employment in academia and the wish of scientists to have children. In addition, possibilities and framework conditions of a parent-friendly scientific culture are discussed. The keynote lecture takes place in the context of the Institute’s Seminar of Nuclear and Hadronic Physics on December 8, 2014, 02:00 to 04:00 p.m., in the lecture hall of the Institute of Nuclear Physics, room 00-200, Johann-Joachim-Becher-Weg 45. Open lecture. Everyone is welcome to attend. The regular meetings for networking and exchange of the Irène Joliot-Curie Programme bring together (young) female scietists and leading physics scholars. At these informal get-togethers, questions of career planning, application strategies and the balance between family and scientific career are discussed. In the winter term 2014/2015, Prof. Dr. Gudrid Moortgat-Pick from the Institute of Theoretical Physics at Hamburg University will be our guest. The networking and exchange meeting takes place on January 20, 2015, from 02:00 to 04:00 p.m., in the media room, Staudinger Weg 7, room 03-431 (please note the new location in contrast to the flyer). All (young) female scientists in and around PRISMA are invited. If you are interested, please register for this event at prisma@uni-mainz.de until January 13, 2015. Coffee, tea, and cookies are served starting at 1:45 p.m. Application and interview situations are part of all career stages: In order to start a fruitful exchange among (young) female scholars in and around PRISMA on this topic and to prepare them for the challenges specifically in the context of the physics work environment, applications and job interviews are at the center of attention of the Irène Joliot-Curie Programme in the winter term 2014/2015. Round tables offer the opportunity to exchange experiences on the topic of applications, the possibility to deepen findings and knowledge from previous application and appointment procedures and to get into a conversation with experienced women inside and outside scholarship on this topic. The round table on applications in the field of physics takes place on November 24, 2014, from 12:00 to 1:30 p.m., in the seminar room of MITP, Staudinger Weg 9, room 02-430/432. All (young) female scientists in and around PRISMA are welcome. In application and appointment procedures, besides the ‘hard factors’ such as research qualification, the ‘soft factors’, e.g. communicative and rhetorical competence as well as personal appearance, play a significant role. In order to promote these soft skills, the Irène Joliot-Curie Program offers an interactive presentation training. It is based on short presentations on easily comprehensible, general topics in English and German. 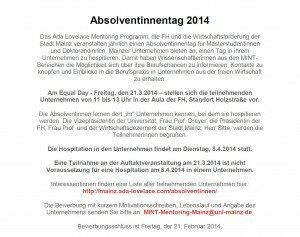 The interactive presentation training takes place on February 9, 2015, from 12:00 to 2:00 p.m., in the seminar room of MITP, Staudinger Weg 9, room 02-430/432. All (young) female scientists in and around PRISMA are invited. 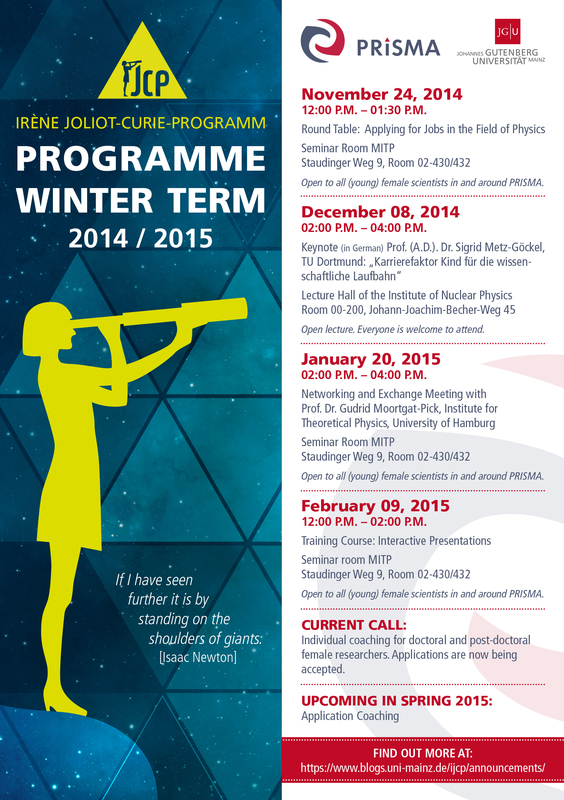 If you would like to take part, please sign up at prisma@uni-mainz.de until February 2, 2015. Lunch snacks are included. For the spring of 2015, application training for (young) female scientists in and around PRISMA is currently being planned. This programme will complement the general application trainings offered by JGU in order to target the specificities of application and appointment procedures in the field of physics. The dates for this offer will be announced shortly. Network-meeting with Sibylle Günter, Scientific Director of the Max Planck Institute for Plasma Physics in Garching, on June 10, 2014 in the HIM-conference room, 00-315, Johann-Joachim-Becherweg 36 (Building SB I, opposite the nuclear physics) from 2:30 p.m. (coffee and tea from 2:15 p.m.). 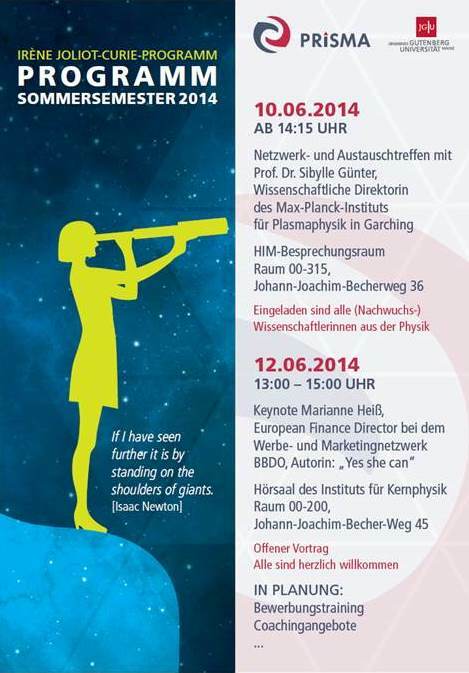 Keynote Lecture on June 12, 2014, 1:00 pm - 3:00 pm: Marianne Heiß "Yes she can"
The iwib - Hochschule RheinMain institute for qualification - offers a training-program for women in leadership positions.